You are here: Frontpage » Discontinued products » Platine Noiree - Majestic Elegance. Platine Noiree contains a series of patented and innovative technologies, and is made differently than any other speaker on the market. Access to advanced technology and manufacturing methods have enabled our engineers to combine exclusive cabinet materials, advanced crossover components and innovative drive units. The result is Platine Noiree - an unparalleled line of speakers. Several unique technologies places Platine Noiree in a class by itself. They possesses abilities known from speakers many times their size. Platine Noiree's 4 "bass / midrange units' is of a high-performance long-throw design and provides a performance equivalent to those of traditional 6 ½" units. These units are equipped with high poly-ether suspension that enables exceptionally long travel without deformation or distortion. The cone is made of a specially formulated rigid lightweight poly-injected material, which ensures quick and transient response. The magnet system is triple stacked, which ensures long and accurate travel even at high power levels. The patented SLAPS (Symmetrically Loaded Audio Passive System) technology enables Platine Noiree to reproduce subsonic frequencies. Traditionally, slim speakers are limited in their ability to reproduce deep bass due to small units and reduced cabinet volume. SLAPS technology overcomes these limitations. Platine Noiree is equipped with a 10 "SLAPS unit, pneumatically coupled to the four 4" long-throw drivers in front. 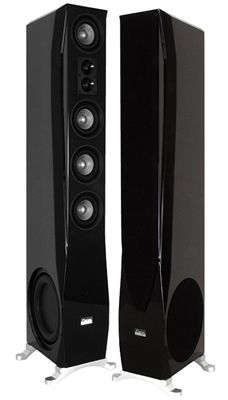 The technology makes it possible to tune a slender speaker to reproduce very low frequencies. SLAP has no annoying port noise and turns out deep bass from a compact volume. SLAPS advances the dynamic capability of a smaller speaker. Opposed a traditionally closed construction which often have difficulties with the deeper harmonics. In a closed design the pneumatic resistance to the woofer rises as woofer stroke is increased, this compresses the reproduction of bass frequencies. SLAPS technology possesses none of these limitations and because of the low tuning frequency deep tones are reproduced with ease. When a traditional speaker face tones below its tuning frequency it results in uncontrolled and potentially harmful woofer movement as the woofer resonates. Platine Noiree - a slim speaker with 500 watts power handling and bass response to 20Hz. It was the desire for uncompromising supertweeter performance, which led to the design of the unique dual wide-band supertweeter module in the Platine Noiree. A supertweeter is a tweeter specially designed to reproduce the very high tones above 20 KHz. Traditionally a supertweeter is a small tweeter mounted above the normal tweeter. From an aural perspective the ability to reproduce overtones is certainly desirable, but it must not be at the expense of the whole musical experience. Music and technology must be in tandem. This realization became the basis for the development of wide-band treble drivers. Wide-band is a tweeter which combines the ordinary tweeter and super tweeter in one unit. The design of a device that incorporates both the high and very high tones, overcame the harmonic problems known from the traditional separate tweeter / supertweeter construction. The wide-band design is free from mechanical and electrical transition between the high frequencies. Reproduction of the really high notes makes great demands on a units speed, to ensure speed the units mass and size must be kept small. Volume of sound generated by a device is the product of surface area times motion, the higher the tone the less surface area and movement needed is for a given volume. To optimize the tweeter volume in the lower frequencies, the double wide-band module was developed. The cabinets are made of solid HDF (high density fiberboard) with a thickness of 2.5 cm. Each cabinet is built around an internal skeleton made of a wood and epoxy composite material. Cabinet finish is a unique process in several stages, beginning with priming and sanding of the cabinet surface. This is followed by several layers of black lacquer with a fine sanding between layers, finished with a smooth and deep clear-coat. The cabinet is carefully polished and possesses a smooth and soft super refined finish that sets the standard for elegance. Dimensions (HxWxD): 113 x 15.2 x 27.9 cm.